Nick Cooper: drums & perc. In 1998, Free Radicals’ firrst CD “The Rising Tide Sinks All” warned against the next Iraq War four years before it started. A decade later, Pakistan’s leading English newspaper, Dawn, called the CD “a premonition waiting to become true.” In 2012, Free Radicals' fourth CD “The Freedom Fence” warned against border walls four years before Trump made them a cornerstone of his campaign for president. 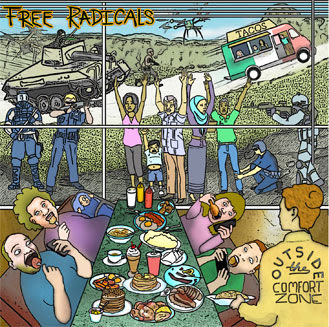 Now on its 20th year, Free Radicals presents a new CD “Outside the Comfort Zone,” that warns against a white supremacist apartheid society in which consumers are oblivious to human rights abuses going on right outside the window. 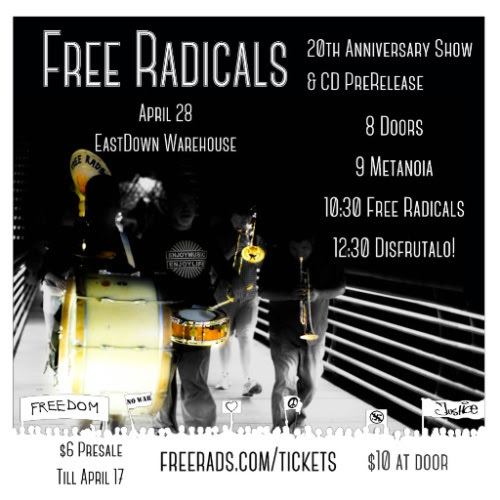 Free Radicals is a horn-driven instrumental dance band with a commitment to peace and justice, and is the 13 time winner for “Best Jazz” in the Houston Press Music Awards. Equally comfortable performing in clubs, street protests, punk rock house-parties, art open- ings, weddings, funerals, and breakdance competitions, Free Radicals prides itself in adaption and supporting members of targeted com- munities for whom “apartheid” is not merely a metaphor. On the new recording, Free Radicals welcomes many guests including Harry Sheppard & Damon Choice, two elder vibraphonists who played with Benny Goodman and Sun Ra Arkestra respectively, along with a dozen other long time collaborators.